Bahrain became the first Arab country to blacklist Hizbullah as a terrorist organization, citing its training of radical Shiite groups. Bahrain on Tuesday became the first Arab country to blacklist Hizbullah as a terrorist organization, the Al Arabiya network reports. The move came a week after the Bahraini parliament voted to label the group a terrorist organization. Its alleged backing and training of radical Shiite groups against Bahrain was the main reason given for the decision, the report said. The Bahraini cabinet has tasked the interior and foreign ministries with implementing the decision. “The measure is to protect Bahrain’s security and stability from Hezbollah’s threats,” Bahraini MP Adil al-Asoumi told Al Arabiya. There is evidence that Hizbulah is instigating violence against the government in Bahrain, Asoumi added. Intelligence has been gathered from defected Syrian soldiers, who had previously “trained Bahraini cells, with Hizbullah backing, to carry out terrorist operations in the country,” Asoumi said. The regime in Damascus has long been backed by its regional allies Hizbullah and Iran, who are both considered enemies of Manama. “When we were in Syrian refugee camps in Turkey, we met with defected Syrian soldiers. They told us that in the past years, the Syrian regime was conspiring against the people of Bahrain” in coordination with Iran and Hizbullah, Abdulhalim Murad, deputy head of Bahrain’s Islamist al-Asala bloc, told Al Arabiya. Hizbullah is not only a threat to Bahrain, but the rest of the Gulf region, so “we call on our Gulf brethren to confront the terrorist organization to secure Gulf security,” said Asoumi. In November, Bahraini police arrested four suspects in connection with bombings that killed two Asian expatriates in the capital Manama and fingered Hizbullah as being behind the attacks. In recent months, pressure on the European Union to add Hizbullah to the list of recognized terror groups has increased, particularly since Bulgaria named the terror group as being behind the terrorist attack in Burgas last July, in which five Israelis were killed. 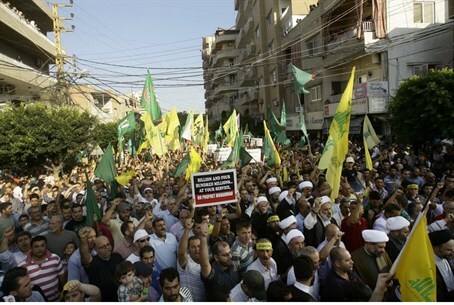 However, diplomats have indicated that it is unlikely that Europe will name Hizbullah a terrorist organization because of its political strength in Lebanon.